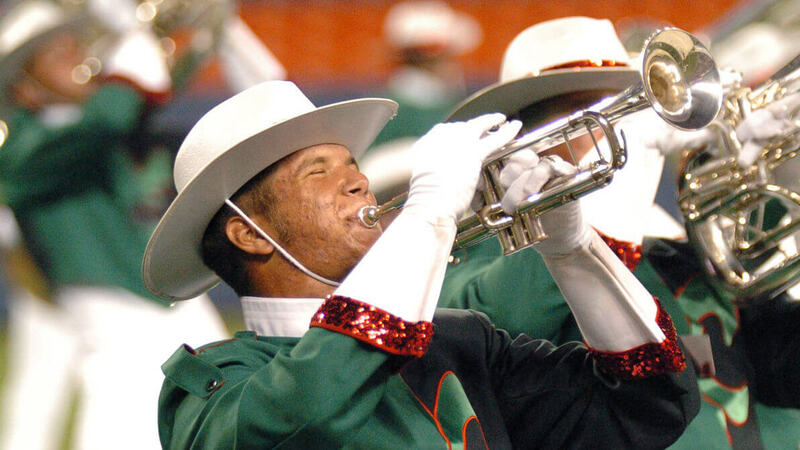 The Drum Corps International Tour ended a week earlier than normal in 2004 due to another event that had been previously scheduled into Denver’s Invesco Field at Mile High, during what normally would have been World Championships Week. The early end to the season allowed DCI to stage the Tour of Champions, which took current and former World Championship-winning corps on a post-season exhibition tour of California. 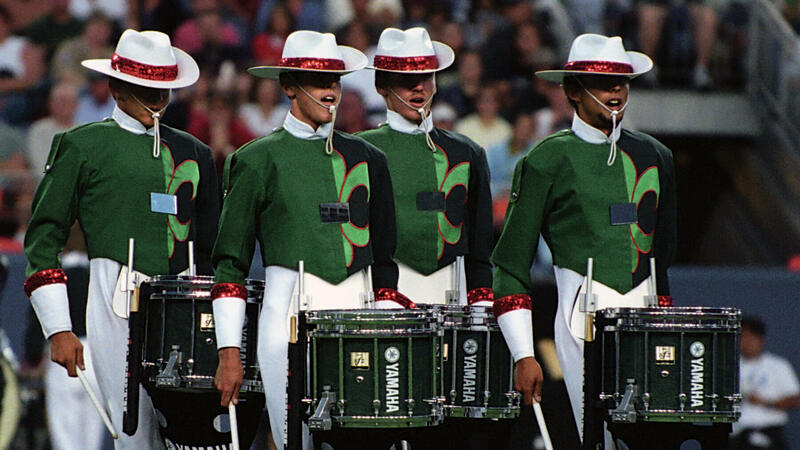 The 2004 season witnessed the legalization of amplification in the DCI rulebook, resulting in several corps embracing the ability to electronically enhance acoustic sounds, such as front ensemble percussion instruments and the human voice. The Cavaliers’ “007” outscored Blue Devils’ “The Summer Train Blues Mix” in the Finals competition by just 0.175, and Glassmen earned a spot in the top-12 over Spirit by an even smaller margin, 0.075. The Madison Scouts finished 2004 in eighth place with “Madisonic,” a production comprised of Oliver Nelson’s “Sound Piece for Jazz Orchestra” and Bill Holman’s “Malaga,” both West Coast jazz composers particularly active in the 1960s. Nelson was known for being predominantly representative of West Coast cool, while Holman was unabashedly “hot,” especially in his arrangements for Count Basie and Stan Kenton. Of the two, Nelson is the one most a mystery to many, even though he wrote extensively for just about every major jazz band of the era, including Count Basie, Maynard Ferguson, and Buddy Rich, as well as composing for television and movies. Among his most famous contributions to television was his scoring for “Ironside,” “Columbo,” and “The Six Million Dollar Man.” He undoubtedly would have become more famous had he not died in 1975 from a heart attack at the age of 43. “Sound Piece for Jazz Orchestra” came off Nelson’s 1966 album, “Sound Pieces.” The album has been compared to Stan Kenton’s more exploratory efforts of the 1950s and 1960s, such as his Neophonic era. “Sound Pieces” was not nearly as famous of Nelson’s 1961 album, “Blues and the Abstract Truth,” which became known as one of the most important modern jazz albums ever. The entire color guard section, sans equipment for the first 35 seconds, picked up rifles for a few seconds, then moved to flags imprinted with consecutive arcs that reflected those of the Doppler Wave. Remember; the title of the piece was about sound. The first movement of “Sound Piece” was a sort of restrained “hot,” about as hot as a “cool” piece could be allowed to get. The second movement of the work, however, was relatively quiet and more like a ballad. Madison Scouts staffers said that the opening of this section included a normal Doppler Wave and the concentric waves at the end of the ballad drill evolution were as if a stone was dropped into water. The final segment of the piece commenced with an intense drum intro, then rapidly moved into the start of Bill Holman’s “Málaga,” previously performed by the corps in 1994 and 1995. Hired by Stan Kenton as a saxophonist in 1951, Holman became the band leader’s chief arranger. His arrangement of “Malagueña” has also been a staple for the Madison Scouts and other drum corps over many years. After the mysterious intro, the brassy hit was accompanied by another all-rifle feature for the color guard performers up front. The brass line compressed into a company front on the right 40-yard line and moved it to the 50-yard line, where a horn echelon pivoted to a 45-degree angle before breaking apart into a shallow wave form. From there to the end of the show, it was the Scouts on fire as fans had come to expect, accompanied by the spinning of blazing flags. The corps’ trademark fleur-de-lis evolved across 30 yards, followed by one last Doppler Wave evolution in the drill formations. Then, to put an exclamation mark on the entire show, the final chord lasted a whopping 25 seconds, continually getting louder and louder until any sense of sound waves was dashed to smithereens.